From webcomics to iPad apps to same-day digital downloads of print comics, graphic novels and comic books have undoubtedly entered the digital age. While the majority of comics are still sold in hard copy, demand for and access to digital content is steadily increasing. Our 3rd annual graphic novel event explores this trend, featuring a panel discussion with three Philadelphia comic book professionals who are redefining the way we view the graphic novel. In partnership with the Villanova University Writing Center, Falvey Memorial Library is proud to present “Graphic Novels in the Digital Age.” The event will be held on Wednesday, Oct. 26, at 3:00 pm in the library first floor lounge. Josh Levitas handles the graphic design, web design, iPad user interface design, production art, and hand lettering for Ulysses “Seen,“ an online graphic adaptation of James Joyce’s masterwork that has garnered attention from The New York Times, TIME, Wired and The New Yorker. The work was at the center of a storm of controversy when Apple requested that two images be censored before it could be released in the iPad app store. The attention garnered from this new censoring of Ulysses, 90 years after it was first banned in the United States, caused Apple to reverse their decision. Ulysses “Seen” is the flagship project of digital media publisher Throwaway Horse LLC. As a founding member of Throwaway Horse, Levitas develops educational apps that unite literary classics, comic book art and scholarly research. 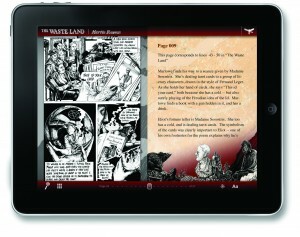 Spring 2011 saw the release of Martin Rowson’s The Waste Land “Seen,” an iPad app featuring a graphic novel film noir-style parody of T.S. Eliot’s epic poem with full reader’s guide. Tony Trov and Johnny Zito develop and write popular comic book series for publishers including DC Entertainmentand digital retailer Comixology. These comics include Black Cherry Bombshells, an apocalyptic future series about zombies and girls gangs, La Morté Sisters, the story of an all-girl vampire boarding school, and Moon Girl, a superhero comic set in 1950s New York. Moon Girl was created for EC Comics in 1947, but the character has since slipped into the public domain. Trov and Zito revamped her character for their series. 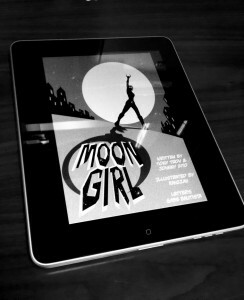 The digital Moon Girl comics proved so popular that they were printed and sold in hard copy at comic book shops nationwide. Through their intellectual property studio, South Fellini, Trov and Zito have also put their visual storytelling skills to use creating films for Ford, as well as Alpha Girls, an independent horror film. They are set to film an adaptation of their scifi comic book series The Dogs of M.A.R.S. in 2012. The event will feature presentations by the speakers, a panel question and answer session and an iPad gallery of digital graphic novels for attendees to browse. Snacks will be served. The event is free and open to the public. I love the artistry of “Ulysses ‘Seen'” and look forward to the panel presentations! Thats pretty cool with using the ipad!